Early map of Scandinavia showing Finland as part of Sweden. Scandinavia, or Sweden, Denmark and Norway. 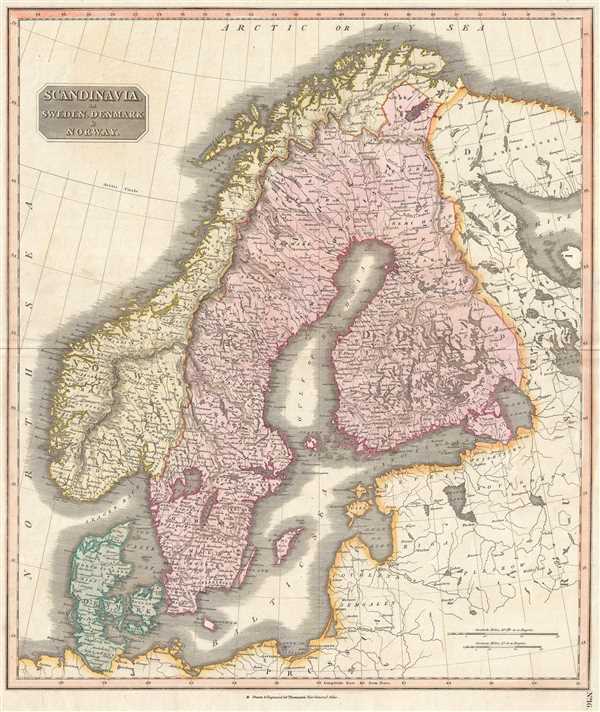 This fascinating hand colored 1817 map of Scandinavia depicts Sweden, Denmark, and Norway. Modern day Finland, though included, was then part of the Kingdom of Sweden. Relief is shown by hachure with towns, cities, and major topographical features identified. The legendary and semi-mythical whirlpool known as the Maelstrom in northwestern Norway is noted. This legendary whirlpool was an inspiration for Edgar Allen Poe's classic tale Descent into the Maelstrom. In reality, the Maelstrom is a periodic and powerful current caused by tidal variation in the region. At this time in history, Scandinavia was in the midst of a prolonged period of peace and prosperity that led to a cultural and population boom. The whole map is beautifully engraved in the minimalist English style pioneered in the early part of the 19th century. Thomson maps are known for their stunning color, awe-inspiring size, and magnificent detail. Thomson's work, including this map, represents some of the finest cartographic art of the 19th century. This map was prepared by John Thomson for inclusion in the 1817 edition of Thomson's New General Atlas.